Kevin Keane will miss the rest of this season with an injury. WESTPORT MANAGER DAMIEN Loftus has confirmed that the knee injury suffered by Kevin Keane in his club’s All-Ireland Intermediate football final win on Sunday will end his season. The highly-rated full-back was stretchered off the field after just 11 minutes and Loftus confirmed this morning that it was an anterior cruciate ligament (ACL) injury meaning he will miss the rest of the year. The Westport boss was speaking to MidWest Radio after a scan on Monday reveled the extent of the damage to the 26-year-old’s knee. Keane’s injury is yet another blow for Mayo manager Stephen Rochford who must already plan without both Aidan and Seamus O’Shea, Chris Barrett, Ger Cafferkey and Michael Hall due to injury. Additionally, Alan Freeman left the panel last week due to work commitments while Tom Parsons is suspended for their next Allianz Football League clash with Roscommon. In better news, Brendan Harrison is poised to return from the hip injury that has kept him on the sidelines since last November. Email “From All-Ireland success to injury heartbreak - Kevin Keane ruled out for 2017”. 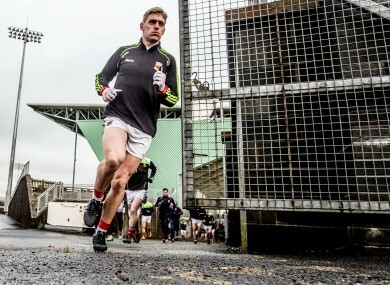 Feedback on “From All-Ireland success to injury heartbreak - Kevin Keane ruled out for 2017”.